Hiperbaric is a young, innovative industrial company exclusively dedicated to High Pressure Processing technology. Learn why and how we became leaders and benchmark in this food technology field. Our strategy has only one word: Reliability. Hiperbaric is committed to quality. A constant in our daily work is Total Quality in industrial processes and management. Hiperbaric is constantly implementing improved processes to meet the highest quality standards and to provide the best response to our customers´ needs. 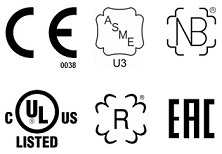 CE Certificate for Pressure Equipment, 2014/68/UE Directive.